There is something special about Champagne, and this something--which is unique to Champagne, not just to sparkling wines in general--has, I suspect, always been there, ever since Champagne as we know it today first began to be produced in the later half of the seventeenth century. Champagne is the celebration wine. It launches ships; it commemorates anniversaries; it toasts weddings. As Talleyrand, foreign minister of France in 1814, said, it is a civilising wine; an elevating wine, as Jorrocks neatly put it ('champagne certainly gives one very gentlemanly ideas'). It can even change principles: 'I'm only a beer teetotaller, not a Champagne teetotaller' (Candida). And it can lead to flights of fancy which no other wine can match. John Arlott in his book on Krug quotes a schoolgirl's first experience of Champagne: 'It's like icicles of rainbow in my mouth.' What a marvellous expression! I wish I'd thought of it! Above all, Champagne is a joyful and luxurious wine--and by that I do not mean one has to live in the lap of luxury to be able to afford it. It is not pricey; indeed it is much less expensive by comparison with other top wines than it was ten or twenty years ago. By luxurious I mean that it induces a feeling of luxury, of well-being and gracious living, in the same way as dressing-up for dinner does. André Simon, Champagne promoter and connoisseur par excellence, coined the phrase 'The Art of Good Living'. No wine is more an example and a celebration of this art than Champagne. Champagne is both a province and a wine. La Champagne is the region; le champagne is what is produced. The reason for the change of gender is that le champagne is really short for le vin de la Champagne. The name is derived from the Latin campania, meaning plain, and the region is one of the historic provinces of France, bounded by Belgium and Luxembourg on the north, Lorraine on the east, Burgundy to the south and Picardy and the Ile de France to the west. At the Revolution France was divided into dé--the province of Champagne was split between the dé of Ardennes, Marne, Aube, Haute-Marne and parts of Aisne. La Champagne viticole is almost entirely centred on the Marne with about 75 per cent of the potential total vineyard of 30,700 hectares. The Aube has 17 per cent and the rest are scattered between the Aisne, Seine-et-Marne and Haute-Marne. Theoretically, the total production of Champagne could reach 400 million bottles a year (see page 546). In practice, in a region at the extreme northern limits of grape-ripening, frost and other weather hazards bite into the potential crop. Harvests in recent years have been as low as 152 million bottles (1985), and even in super-abundant vintages such as 1982 and 1983, only the equivalent of some 300 million bottles were produced. The annual average for the five years 1993 to 1997 was 258 million bottles, and that is before allowing for the inevitable loss and evaporation between harvest and bottling. Meanwhile consumption climbed from 237 to 270 million bottles between 1988 and 1997. So supply is hardly keeping pace with demand. Another short crop will be a disaster. This is perhaps the place to highlight the other important sparkling wines found in France. The Loire Valley (sparkling Vouvray, Saumur and others) is a major source. Cré de Bourgogne comes closest in character to Champagne (the same grape varieties are used). Those of Alsace and Limoux can be delicious. Those from Die, a valley halfway down the Rhô Valley are less so. Champagne, though, considerably outsells the combined total of all these wines. Nearly all France's appellation contrôÈe sparkling wines are made by the Champagne method (though one is no longer allowed to use the phrase mé champenoise or a translation thereof--other regions now have to use the term mé traditionnelle or Traditional method). Lesser wines are made by the cuve close or Charmat method, the second fermentation taking place in bulk, in tank rather than in bottle, prior to filtration and bottling under pressure. 1998 Champagne escaped the frost and hail which had reduced the crop in Chablis and further south. After a good August but a rainy september there was a record crop. Quality, reflecting this volume, is merely fair. 1997 A small harvest. After a poor summer fine September weather produced wines both high in alcohol and acidity. Very good quality at best: but variable. 1996 A good-sized harvest. Excellent weather during the run up to the vintage produced very healthy ripe fruit. Never before have there been musts with such high sugar readings and such high acidities. Fine quality. Almost certainly to be declared as vintage. 1995 A large harvest. After a shaky start--frost in April and again in May--the flowering was successful and the summer warm and dry. After a rainy start to September the harvesting weather was benign. Very good quality. Probably to be declared as a vintage. 1994 A small harvest. The summer was largely fine, but the weather deteriorated in September and then improved at the end of the picking period. Nevertheless rot was widespread and a severe sorting out of the fruit was vital. Average quality only. 1993 An average harvest. The summer was uneven, odium and mildew prevalent, and heavy rain set in just as the harvest was about to commence, causing widespread rot, and lowering the acidity of the wines. Not great, but a stop-gap vintage for some houses. 1992 A large harvest. An early harvest after a generous good summer was a little interrupted by rain but nevertheless produced a satisfactory if not outstanding crop, best in the Chardonnays of the Cô de Blancs. Declared by some houses as vintage. 1991 A large harvest, despite frost in late April. After a good summer the harvest, which began late, was spoilt by rain. Quality is only fair. 1990 A large harvest. After a poor spring, including frost in early April, the summer weather was excellent. The harvest was early, the fruit ripe, the level of potential alcohol high, as were the acidities. A splendid vintage of very high quality: firm, beautifully balanced, elegant wines which will keep for a long time. 1989, 1988, 1986, 1985, 1983, 1982, 1979, 1976, 1975, 1973, 1971, 1970, 1969, 1966, and 1964. Champagne can vary widely in style. Not only will there be differences according to the quality--vintage, non-vintage, or de luxe--but also according to the grapes used. Moreover Champagne changes character as it ages. Additionally each house has its own particular style, and just as the discerning eye can differentiate between Monet and Renoir, so can (though I must personally confess with rather more difficulty) the discerning palate distinguish between, say, Bollinger and Pol Roger, and identify Krug without seeing the label. Which style and which vintages you prefer are as much a question of personal taste as inherent quality. In the profiles of the leading producers (see page 551) I attempt to give an indication of the house style as well as denoting which are my particular favourites. In fact my taste for Champagne is extremely catholic. It is the supreme wine to drink alone or in company, at any time of the day or night, with or without food. There is an increasing vogue for both Champagne rosé and Champagne produced exclusively from white grapes, Blanc de Blancs. The rosé is produced by mixing a litle red wine with the white before bottling (Champagne is the only French wine where this is allowed), although it can be produced by making a rosé in the usual manner and then applying the Champagne method to that. In my view, though this is not stipulated in the legislation, it should also be produced entirely from the Pinot Noir grape, and those which are do stand out as more elegant and interesting examples. For some reason which I do not fully understand, rosé Champagne is more expensive than the normal wine. It can be both vintage and non-vintage. Recommended wines: Billecart-Salmon, Lanson, Perrier-Jouë, Pol Roger, Pommery's Cuvé Louise Pommery, Roederer, Taittinger's Comtes de Champagne and Veuve Clicquot. Blanc de Blancs, made exlusively from the Chardonnay grape, is, or should be, lighter and slimmer than ordinary Champagne, delicate as well as elegant. There are some delicious Blancs de Blancs which fully justify the extra price, for if they come from the Côte des Blancs exclusively they are bound to be expensive. Other examples, though, seem rather thin and pale in character when drunk alongside a good non-Blanc de Blancs wine. It can be both vintage and non-vintage. Recommended wines: Billcart-Salmon, Krug's Clos de Mesnil, Mumm's Mumm de Cramant, Bruno Paillard, Pol Roger, Salon and Taittinger's Comtes de Champagne. Blanc de Noirs, literally 'white of blacks', is a Champagne made entirely from either or both Pinot Noir and Pinot Meunier. There are very few of these wines. Bollinger produces a delicious but very, very expensive wine from a small plot of vieilles vignes françaises (ungrafted vines). The colour is golden, rather than straw-yellow and the wine is full-bodied, intensely flavoured, and very rich but not sweet: certainly a Champagne for food rather than for drinking as an aperitif. Champagne can be sold with or without a vintage date, though if it is to have a vintage date 100 percent of the blend needs to come from that vintage. If non-vintage, it cannot be put on the market until twelve months after 1 January following the harvest. If vintage, the stipulation is a minimum of three years. All Champagne houses produce a range of Champagnes from a basic non-vintage wine upwards. The non-vintage wine is the mass-produced brand, and therefore in this sense the flagship wine of the house. Non-vintage Champagne probably makes up 85 percent or more of the market. Vintage Champagne, like vintage Port, is something special. It is, or should be, only declared in exceptional years, say, three or four times a decade, and it should be a wine of high quality, left to mature until it is round, complex, richly textured and full-flavoured. It should not be drunk as an aperitif, before the taste buds are ready to appreciate it, but with food or perhaps after a splendid meal when it can receive the full attention it deserves. Top vintage Champagnes need ten years to mature. The best include Bollinger, Alfred Gratien, Pol Roger, Roederer and Veuve Clicquot. The same ageing period applies to the increasing number of prestige brands or de luxe wines. Led by Dom Pé, Moë & Chandon's de luxe brand, created as long ago as 1935, nearly all houses now produce a superior vintage, often in a fancy bottle, usually with a fancy name. All are expensive, some are delicious. Krug vintage, because of its price, must be considered a de luxe brand. My other favourites include Bollinger RD, Moë & Chandon Dom Pé, Laurent-Perrier Cuvé Grande Siècle, Pol Roger Sir Winston Churchill, Pommé Cuvé Louise, Taittinger Comtes de Champagne and Veuve Clicquot La Grande Dame. In my view, sadly, rather too many, and that applies also to ordinary vintage Champagne, are put on the market too young. All vintage and de luxe Champagnes should have at least five years on their lees and further age thereafter. Nearly all Champagne is produced as Brut or Extra Sec. Only a little sweeter Champagne is produced, to accompany dessert courses. Annual Sales: 1.2 million bottles. The original Bollinger, Joseph (later changed to Jacques when he took French nationality), was a young German who was engaged by Admiral Count Athanase de Villemont to supplement the family fortunes by making wine on his estates. In 1829 Jacques Bollinger set up in business on his own, and later married the Admiral's daughter. One of Champagne's best-loved characters was Lily Bollinger, the wife of Jacques' grandson who ran Bollinger from the death of her husband in 1941 until her own death at the age of seventy-eight in 1977. Bollinger's own vineyards have an average quality rating of 97 per cent, and produce two-thirds of their own requirements. They include two small plots of ungrafted Pinot Noir, the vines being reproduced by layering, or provinage. This produces the Vieilles Vignes Franç, a Champagne of great breed and immense depth of character. Bollinger's vintage Champagne is called Grande Année, a reference to the fact that vintage Champagne is, or should be, only declared in the finest years. Bollinger R.D. is one of my all-time favourite champagnes--the initials stand for récemment dégorgé (recently disgorged) and indicate a wine which has been kept longer than normal--up to as much as ten years--between bottling and disgorging. All this time it has been feeding off the lees, and the result is a wine of great complexity, concentration and richness. Bolligner were the first to publicise the idea and have in fact registered the words R.D. as a trademark. The R.D. is a personal favourite of mine. It was first launched in 1962 with the 1953 vintage. Année Rare is a wine kept even longer on its lees. Bollinger do not use the second and third pressings, even in their non-vintage Spéciale Cuvée; 80 per cent of their production is vinified in wood, and the firm has a stockholding equivalent to five years' sales. A subsidiary company is the sparkling Loire firm of Langlois-Château. Bollinger is one of the great Champagne houses, producing firm, full, meaty wines which last well. Even the Spéciale Cuvée needs keeping, and it has occasionally been put onto market a little early. The Vintage and de luxe wines are truly classic, especially in masculine vintages such as 1990, 1982, 1975 and 1970. Annual Sales: 5 million bottles. Florens-Ludwig Heidsieck, a German wool merchant, set up Heidsieck and Company in the years just before the French Revolution, and the firm passed to three nephews in the 1830's, each of whom went their separate ways. Piper is now the largest of the three. Its de luxe wine is called Florens-Louis. Heidsieck and Co. Monopole was taken over by Mumm in 1972 and now belongs to Paul-Franç Vranken. The prestige marque is called Diamant Bleu and the top wine Champagne Charlie. Charles Heidsieck is my favorite of the three--though none would be in my superstar league--and the wines are fresh, generous, fruity and medium-bodied. Heidsieck and Co. Monopole makes standard, dependable wines. I find the wines of Piper-Heidsieck a bit green and find that they age less gracefully than the others. Annual Sales: 24 million bottles. Moë, even without its subsidiary companies Mercier and Ruinart--not to menion its association with the Louis Vuitton group which owns Veuve Clicquot and others--is by far the largest Champagne house. Moë's vineyards produce about 20 per cent of its needs. Pierre-Gabriel Chandon, son-in-law of Jean Ré Moë, himself the grandson of the founder of the firm, bought the Abbey of Hautvillers in 1823--the monks had previously supplied his father-in-law with wine. Jean-Ré was a personal friend of Napoleon who decorated him with the Lé d'Honneur. At the suggestion of Lawrence Fenn, an English journalist, the firm launched Dom Pé in 1935 to celebrate the centenary of it agency in Britain. This wine, from a blend of roughly half Pinot Noir and half Chardonnay and only from their own 100 per cent rated vineyards, is one of the best, as well as the best known, of the de luxe brands. It was also the first. Despite the quantity produced, the standard and consistency of the non-vintage Moë is high: a medium-bodied, fruity wine, not absolutely bone dry, which I would put at the top of my second division. It is estimated that the quantity of Dom Pé sold equals more than the combined total of all the other de luxe brands put together. Despite this it really is a top-notch wine, worth every penny of its sadly inflated price. Annual Sales: 4.2 million bottles. Pierre Taittinger took over the business of Fourneaux Forest in 1932 and the group, now run by his son Claude, has since bought the Champagne house of Irroy and the Loire business of Monmousseau and Bouvet-Ladubay. Taittinger is one of the houses which is better known for its prestige wine--in this case, the excellent Blanc de Blancs, Comtes de Champagne--than for its non-vintage. Brut Absolu is a wine with a nil dosage. All Taittinger wines, like those of Ruinart, contain a large proportion of Chardonnay in the blend. I find the non-vintage elegant, fruity and reliable. The Comtes de Champagne is very full and rich, not obviously a Blanc de Blancs: a very fine example which lasts well. Annual Sales: 1 million bottles. In this handsome and engaging book, Clive Coates, one of the world's leading authorities on wine, gives us the most up-to-date, comprehensive, and detailed study of the wines of France ever written. Coates's vast knowledge of his subject together with his natural gift as a storyteller make An Encyclopedia of the Wines and Domaines of France as informative as it is entertaining. He discusses every appellation and explains its character, distinguishes the best growers, and uses a star system to identify the finest estates. With more than forty specially commissioned maps that show the main appellations and wine villages of France in detail and a format that invites browsing as well as in-depth study, this book will be essential reading for anyone, professional or amateur, interested in wine. Coates gives ample reasons for his belief that France produces the finest wines in the world, in a volume and variety no other country can match. He shows how, despite savage competition from other countries, France holds its own. It not only creates great wines, he says, it also produces affordable wines. 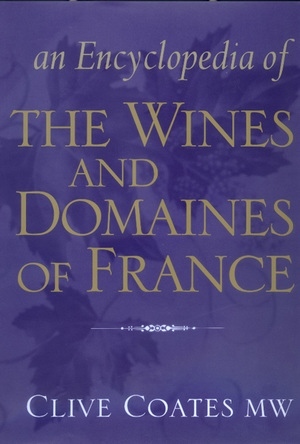 The outcome of thirty-five years of traveling around the French vineyards, this book displays a continuing love and respect for French wines and the vignerons of this remarkable country. In discussing each region and its wines in detail, Coates leaves no stone unturned. His encyclopedic knowledge is evident, bringing the places and the people where these great wines are created to life. Clive Coates, M.W., was awarded the Chevalier de l'Ordre du Mérite by the French government, the Ruffino/Cyril Ray Memorial Prize for his work on Italian wine, and the title of Wine Writer of the Year for 1998/1999 in the Champagne Lanson awards. He has published The Vine, his independent fine wine magazine, since 1985. His books include Claret (1982), Wines of France (1990), Grands Vins: The Finest Chateaux of Bordeaux and their Wines (California, 1995), and Côte D'Or: A Celebration of the Great Wines of Burgundy (California, 1997), which won the Champagne Veuve Clicquot Prize, the André Simon Award, and the James Beard Award.